South led the 8 – a reasonable shot, but the only suit to give declarer a shot at the contract. 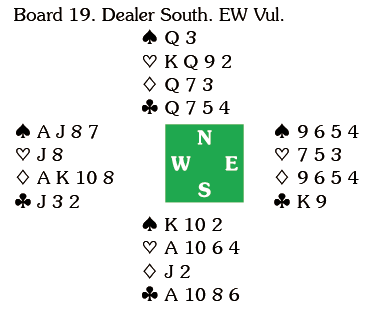 Declarer took North’s queen with the king and played a spade to the seven and queen, North switching to the Q followed by the king, which South overtook with the ace to continue with the ten. Declarer ruffed in dummy and exited with a club, South winning with the ten and playing the ace, which declarer ruffed. A spade went to the ten and jack and now all declarer had to do was play three rounds of diamonds. North would win, but would then have no good move. Missing this, declarer drew the outstanding trump and had to go two down. South led the J and declarer won in dummy and played the J, South winning and playing his remaining diamond. Declarer won in dummy again and exited with a heart, North winning, cashing the Q and exiting with a club. 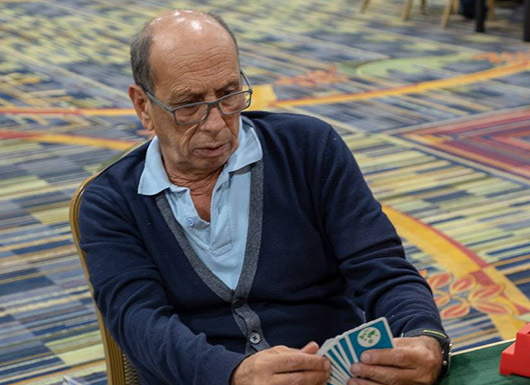 When declarer played low South took the ace and returned the ten to declarer’s king. A spade to the seven lost to the queen, but declarer could ruff the club return and play a spade to the ten for +670. South’s mistake was to play the A. If he puts in the ten declarer wins with the jack and returns a club, but South wins and plays a third club. Declarer ruffs and plays a spade to the seven, but North wins and exits with a heart and South must score another trump for one down. An even simpler defence is for North to exit with a heart rather than a club, leaving declarer to tackle the frozen suit. North led the 3 and declarer put in dummy’s ten, collecting South’s king – another frozen suit scenario. Having won with the ace declarer played on clubs and hearts, cross-ruffing before playing a diamond to the king for ten tricks, +170. As the cards lie, the only way to prevent ten tricks is to start with a diamond – but even then, things are not simple. North found the lead of the Q. South decided to put up the ace (the defence is easier if he withholds it) and he returned the six. Declarer put up the king and North followed with the two. Now the far from obvious winning line is to play a club to the ace, ruff a club and play a spade. If North splits declarer wins in dummy, ruffs a club and exits with a diamond to endplay North. 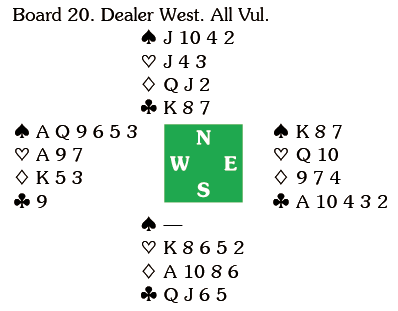 Mind you, declarer would be doing well to put in the 7 if North follows with a low spade rather than an honour. In practice declarer made the natural play of cashing the Q getting the bad news. A club to the ace was followed by a club ruff, a spade to the ten and king, a club ruff and a diamond. North won and had only to exit with a trump to leave declarer a trick short. When he played a low heart declarer could put in the ten, take South’s king with the ace, cross to the Q, ruff a club with the A and play a heart, scoring the 8 en passant. 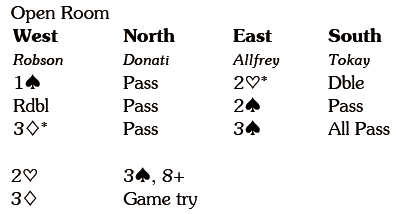 At the point where declarer won a trick with the diamond king North must unblock the J, avoiding any possibility of an endplay (which is why South does best to withhold the ace).